This will be an online/absentee bidding sale. There will be no live sale. You may bid online for this sale, place absentee bids during preview, or call in your bids. Lots will start closing on Sunday April 7th at 8:00pm. Online bidding is open. You may also bid as lots are closing. PREVIEW & PICKUP WILL BE AT 952 CHURCH ST. MOUNT JOY, PA 17552. PREVIEW FRIDAY APRIL 5TH FROM 1:00 TILL 6:00 AT 952 CHURCH ST MOUNT JOY, PA 17552. ITEMS ARE IN THE GARAGE IN THE BACK OF THE PROPERTY. *Scroll below pictures for a pdf file of the catalog. Have your items shipped or pickup Monday, April 8th from 9:00 till 6:00 or Tuesday April 9th from 8:30 till 3:00. If those times don't work for pickup, call 717-618-9727 to arrange a different time. Pickup at 952 Church St. Mount Joy, PA 17552 Pick up your items in the garage on the back of the property. You must pay & pickup your items by Friday April 12th or we will ship them to you at your cost & charge your card on file. 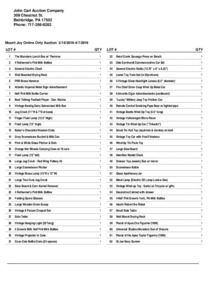 Download "MT JOY ONLINE ONLY SALE #1.pdf"